4th of July means summer is really here. 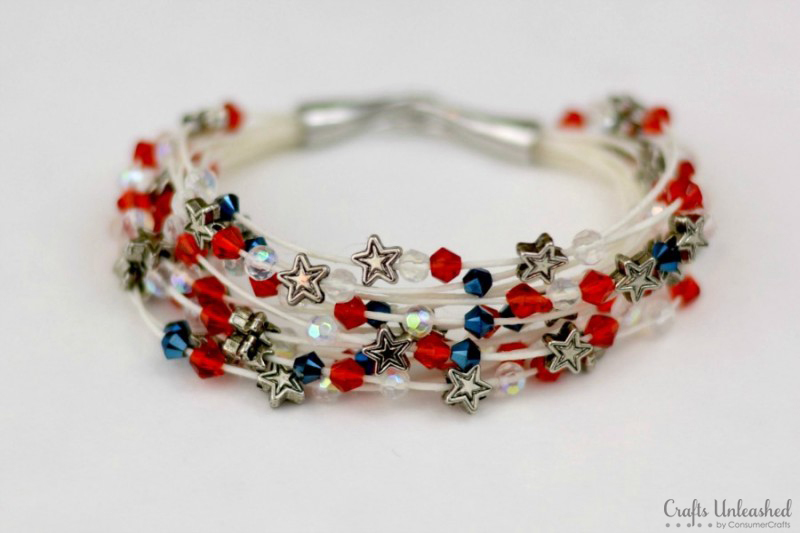 So let’s make some fun jewelry for the 4th and out sparkle everyone!! And 4th of July means a lot to me personally. I’m proud of our country and proud to be an American. We live in the best country ever – and we all have the chance to succeed as long as we work hard and dream big. I love to make layered bracelets, because they give you the look of a stack of bracelets, but you just have one piece to keep track of in your jewelry box. You can add as many or as few strands as you like by choosing different sized end caps. I’ll show you as we go where you can make adjustments to change the style of this bead bracelet. CJ’s Bead Page, many free patterns, the current one is a flat peyote or brick eagle. Aunt Molly’s Bead Street has this wonderful ribbon pin designed by Jan Jones The Creative Spirit hosts several lovely patriotic patterns. 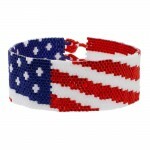 Jeanette Shanigan has a pretty vertical netted bracelet with flags and yellow ribbons. Debra Pyeatt has a red, white and blue brick stitched star that would make a nice pendant. Rings and Things has a couple nice patterns on the project page. Bead Dancing has a lovely pair of flag earrings with nicely illustrated instructions for brick stitch Bead-Patterns.Com has many free patriotic patterns, plus some beautiful ones for sale. There are many patterns available on this site. This is a page of free patterns which include several patriotic patterns. I have been doing Peyote stitch for awhile now and I find it very helpful to enlarge the graph especially since my eyes are not what they used to be. Also they make these magnet boards you put the pattern on and move the magnet strip over each time you complete a row so what you see is always the current row you are working on. That is very helpful to keep your place as well. Once the pattern gets going you can usually see what comes next without much help at all. I can’t wait to make this beautiful bracelet! Make beautiful jewelry quickly, easily and inexpensively with our exclusive kits. Created by our team of expert designers. 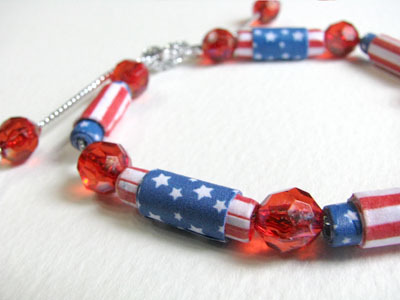 This even count peyote bracelet features a patriotic stars and stripes pattern in red, white and blue. 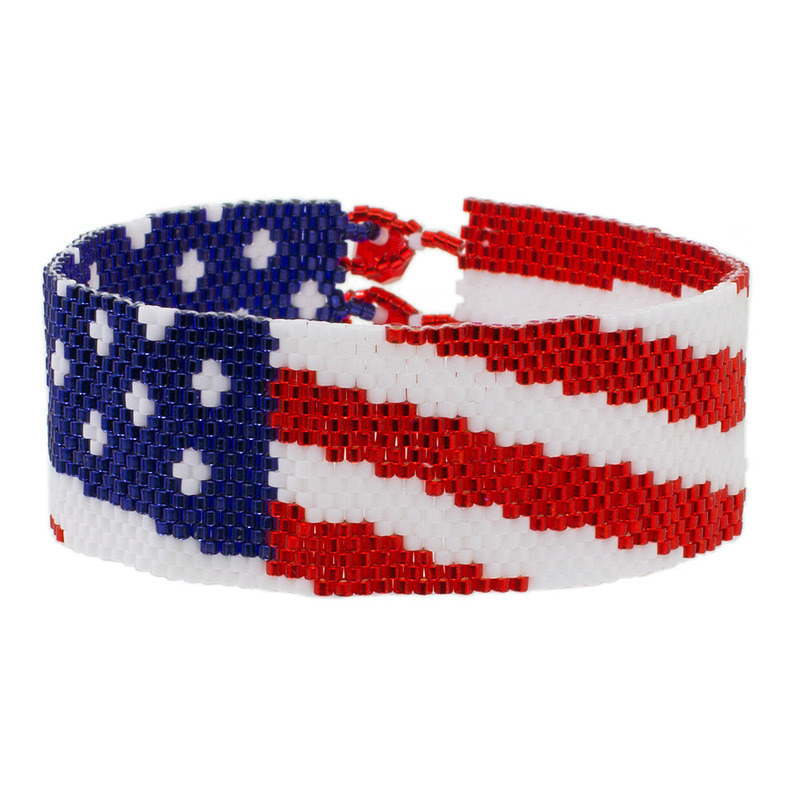 It’s a fun project for bead weavers of all levels and a great accessory for Independence Day.